This Fusion LTE router operates in Band 13, 700 MHz DL MIMO, UL SISO. Designed to be used with Verizon, this device comes with integrated GPS. Fusion offers a single, flexible platform to address a variety of wireless communications needs with over-the-air configuration and system monitoring for optimal connectivity. This ready-to-deploy broadband router enables wireless data connectivity over public and private LTE cellular networks at 4G speeds. 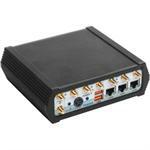 CalAmp Fusion 802.11 b/g or b/g/n WiFi interface with simultaneous access point and client operations supports connectivity to IP applications in a variety of different connection scenarios. Dual USB 2.0 host interfaces are provided to support the connection of external peripherals such as Zigbee or Bluetooth adapters. An easy to use web-based management and configuration interface as well as comprehensive remote management facilities are included. When it comes to public safety, you need a reliable device to deliver critical data quickly and efficiently. CalAmp’s Fusion 4G LTE router accelerates real-time communications and enables vehicle tracking and location-based services.